Reporters who stand behind the velvet ropes at parties shouting celebrity names and “Who are you wearing?”” tend to be a tight-knit crew in sensible shoes with backup recorders stuffed in their pockets. Doing this night after night, year after year can be soul crushing. Imagine standing in a press pen for hours, begging reluctant and sometimes inarticulate celebrities to talk to you for three seconds. But my friend and former colleague, Jeffrey Slonim, who died on Friday at age 56, ate it up. Jeffrey loved the red carpet, which sounds hard to believe now that red carpets before major-awards shows have become hours-long opportunities for celebrities to advertise which designers they are wearing or which nail-polish brand they used (think mani-cam). But he did — and he respected it, too. For every occasion, he wore a tux or white tie with a dashing opera scarf, a seersucker suit in summer, a country-club blazer and khakis in the Hamptons — often he looked as good or better than the crowd he interviewed. And he never shouted. When I started Allure, I asked Jeffrey to report on the celebrity beat because I knew he took his assignment thoroughly to heart. He was one of the first contributors and continued to work with me for all 25 years. As time went by and he developed a reputation, the clever and the press-hungry strode right up to him, eager to play. And Jeffrey was the perfect audience. He’d giggle. He’d have a comeback. His eyes twinkled and sometimes they rolled, conspiratorially. You could tell he had a genuine connection with his subjects, many of whom made a ritual of greeting him with a kiss. He took Julianne Moore to his high-school prom. That fact, and their sweetness when they saw each other at countless movie premieres and awards shows, would just warm your heart. Jeffrey had a way of bringing out warmth and humanity in the starchiest, most handled celebrity. And that was his true gift: the way he got to the essence of each person, through sometimes trivial questions that, in their way, were profoundly revealing. 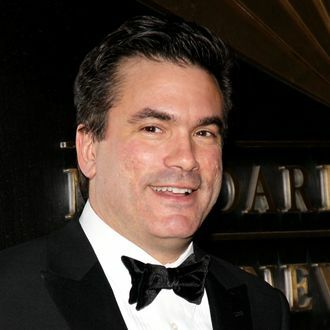 Jeffrey Slonim and I grew up in the media business together, had children around the same time, and wrung our hands over kindergarten admissions and SATs. He worked longer hours than me by far, returning to the office from a party and transcribing his quotes, sometimes until 5:00 a.m. Then he’d rush home in time to take his sons to school. He loved his job. He loved his wife, Fiona Moore, and his sons, Finbarr and Declan. He lifted us all with his giant heart. And I’ll miss him.